In this series, we’ll be going on a little tour, looking at the radical transformation which took place in women’s fashion from the 40s to the 60s. And of course, what better way to illustrate than through plenty of pictures! So why this focus? 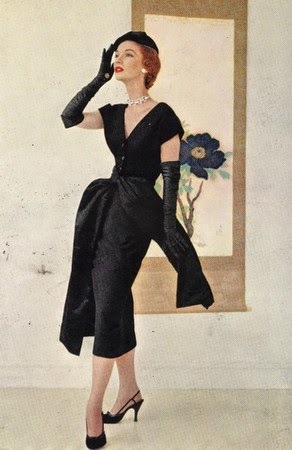 Pure and simple, because within the space of little over 25 years, from the 1940s to the 1950s and through to the 1960s, the transformations in ladies’ fashion were nothing short of amazing. There are few other periods in history we can think of which can lay claim to such dramatic changes in how women dressed in such a short amount of time. Let’s take a look now at what was behind this radical change, starting with the 1940s. 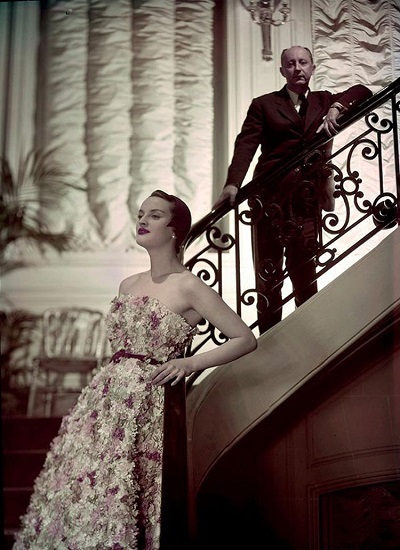 For the most part, the somewhat restrained look of the 1940s emerged from the fact that the world was at war. World War II had only just begun in 1939, and to cope, restrictions and rationing on a whole range of items were progressively introduced. Clothes rationing in Britain officially began on the 1st of June 1941 and to help out in the war effort, many countries in the Commonwealth such as Australia, Canada and New Zealand followed suit. Although clothes were never rationed in the United States, severe restrictions were also gradually imposed on all types of clothing. 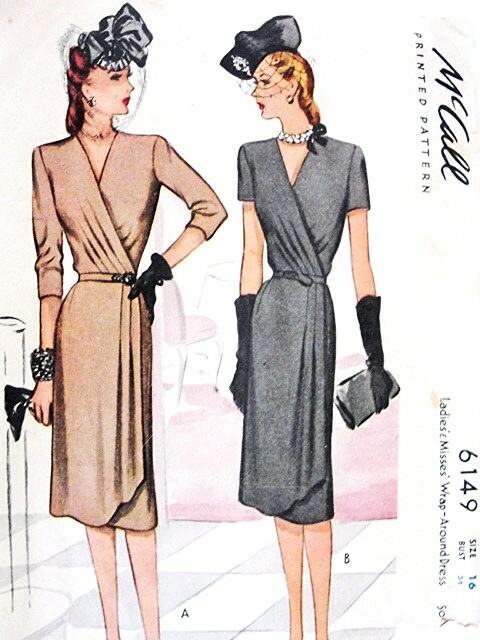 For the ladies, these restrictions covered everything from the length, width and style of dresses (these became shorter with a sleek A line) through to types of fabrics to be used (mostly cotton or rayon), and by 1942, even a prohibition on long sleeves and shawls. The whole range of restrictions and guidelines imposed is quite a read and if you’d like to find out more about this interesting aspect of the war, Make it do by Sarah Sundin is an excellent article covering this topic in detail. 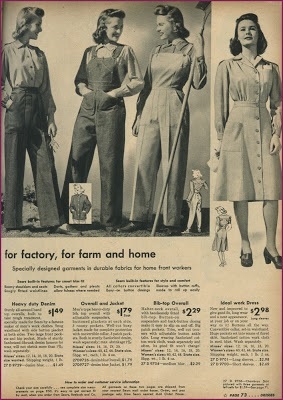 Thus in order to adapt to the times, women’s clothing became more functional and utilitarian, with an almost uniform look to it. 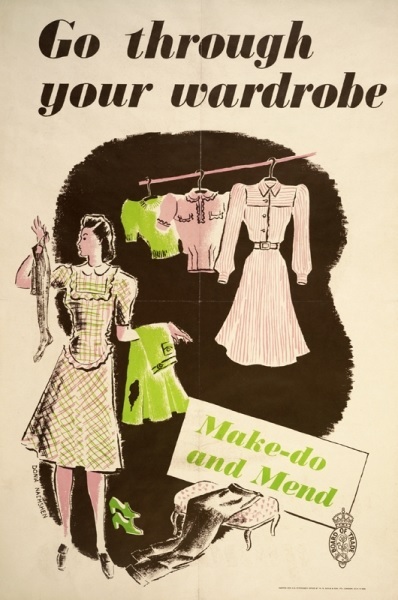 Ladies were encouraged to ‘make-do and mend’, as you can see in this poster from 1942. 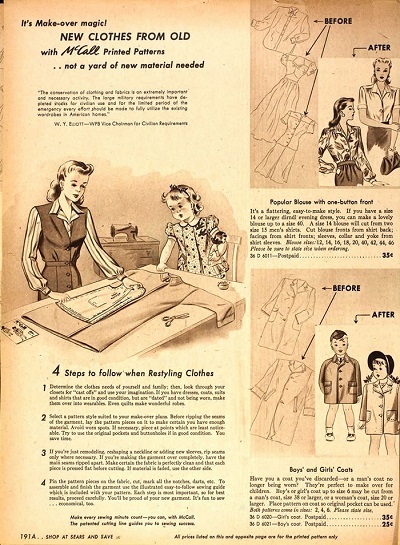 Changes in society which saw women pitching into the war effort also reduced fashion restrictions on them. 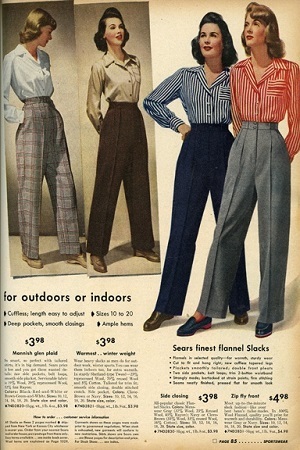 In particular, pants and denim truly arrived as an acceptable fashion choice for women. We love the this next photo which demonstrates this beautifully side by side. 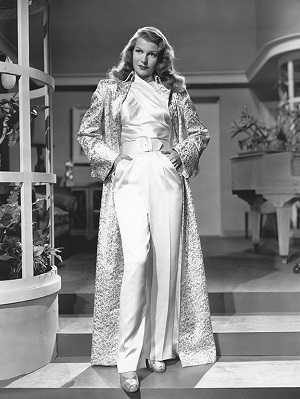 While in the 1930s women wearing pants was considered scandalous and only a few celebrities like Marlene Dietrich or Katharine Hepburn dared to wear them in public, by the 1940s, the necessities created by the war made pants an acceptable and necessary fashion choice for women of all classes. 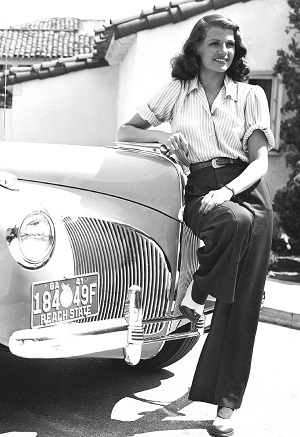 Pants became available not just in the form of practical denim dungarees or overalls but also in the sleek, tailored wide leg pants made popular by celebrities such as Katherine Hepburn and Rita Hayworth. Here are some more examples of that functional, uniform-like style for women. 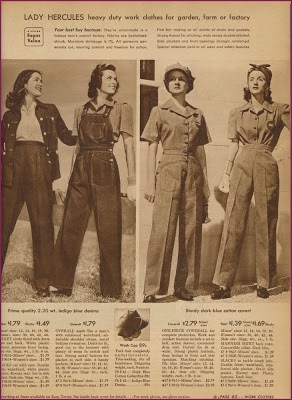 The women in this 1943 Sears catalogue look more than ready to get their hands dirty! It almost looks a little like a communist propaganda ad, doesn’t it? 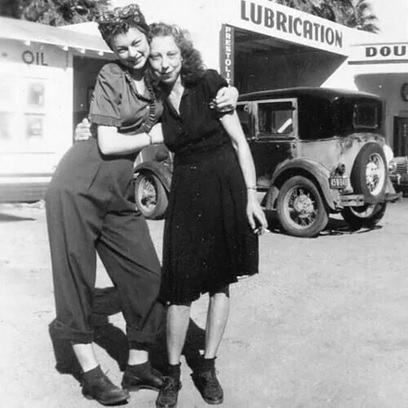 But not every woman wanted to look prepared to fix a tractor engine at short notice of course. 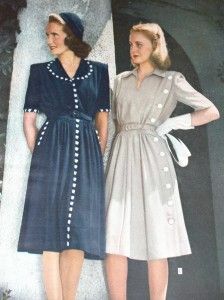 And so the shirtdress, also called the shirtwaist dress arrived, a perfect choice that was both practical and feminine. Now these look a little more elegant! 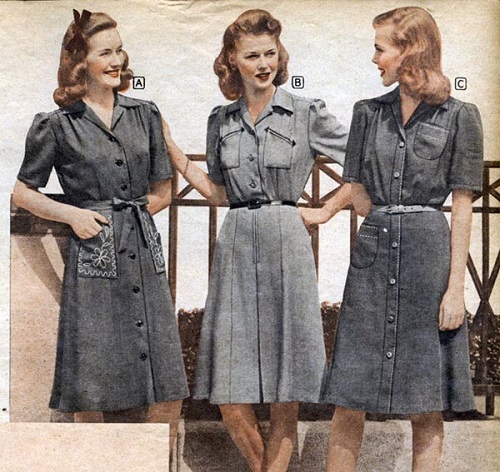 Another innovation of the 1940s due to the war, wraparound dresses and skirts became another popular option because of the unavailability of zippers . 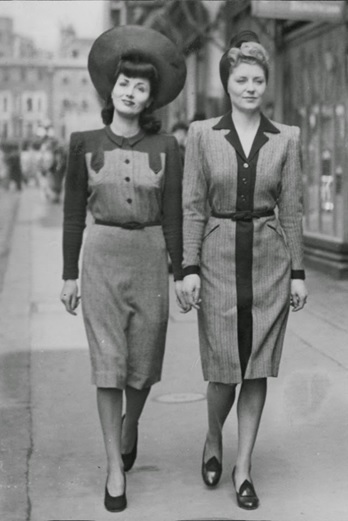 The following photo of two women in 1942 London shows some of the other typical features of vintage 40s fashion; square shoulders, narrow hips and hemlines raised to just below the knee. 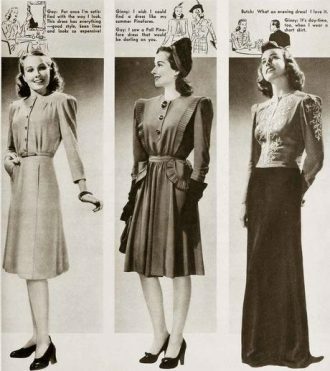 As you would expect given the period, for most of the 1940s, skirts tended to be more plain and functional. During the war and for some years after, they were minimal in detail due to material restrictions as this vintage pattern from 1946 shows. 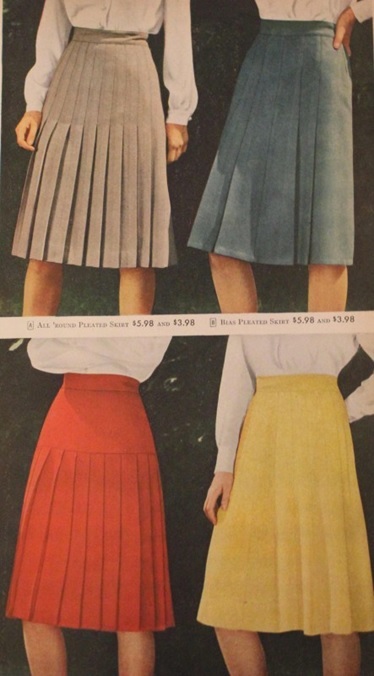 In the late 40s, pleats and bright colours once again made a comeback. After the war ended restrictions slowly lifted. Rationing slowly ended and psychologically, there was a new sense of freedom in the air. 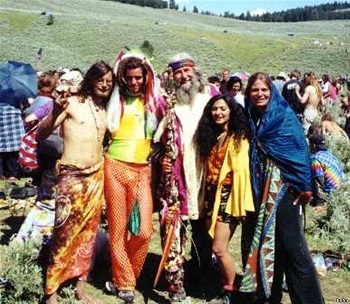 This was also reflected in the fashion where a softness came back into the clothing and women’s fashion in particular. Overall shoulders rounded and hemlines grew longer and soon skirts and dresses went from plain to bright and decorative with the addition of pleats, pockets and frills. 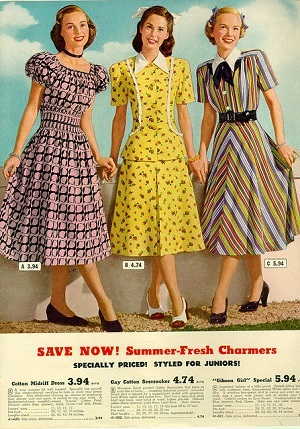 They also broke free from the earlier restrictions on width and volume and by the late 1940s, dresses and skirts began to resemble the bright patterns and swing styles we associate with the 1950s. This shift in look to what we now associate with the 1950s is in large part thanks to one man. 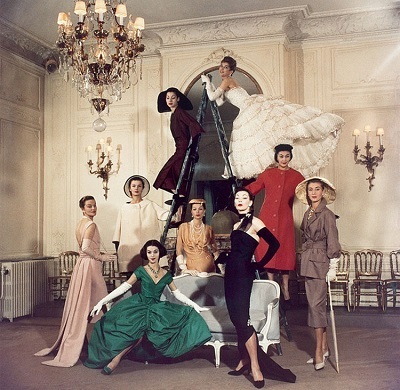 In 1947 Christian Dior introduced his first collection now known as the ‘New Look’, a hugely influential style which shaped the future of women’s fashion for the next decade to come. This look was marked by longer length full-skirts, a cinched in waist and extra padding around the hips to give women a more voluptuous silhouette. But rationing of clothing continued in many countries until the late 1940s so these changes took some time to take hold in everyday fashion. 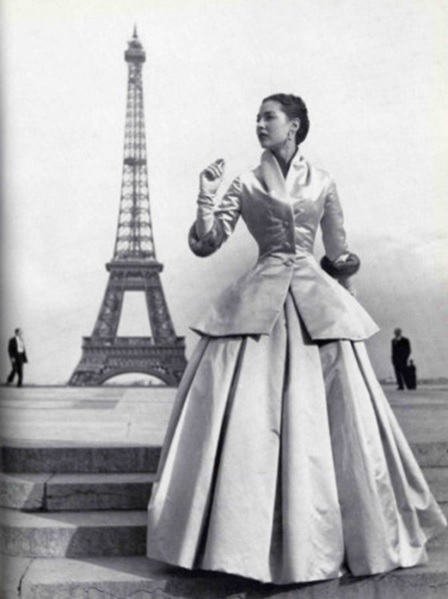 Here are some more gorgeous pictures of Christian Dior’s ‘New Look’ dresses. From the New Look – those are some wings! You can see Dior’s influence on more everyday fashions here. Notice the longer hemlines, softer shoulders and greater embellishments to the dresses. 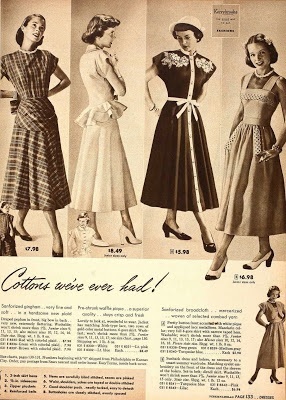 Given the turmoil that the world was in at the start of the decade and the restrictions which were placed on what clothing could be produced, it is actually quite remarkable how beautifully women put themselves together in the 1940s, in spite of it all. 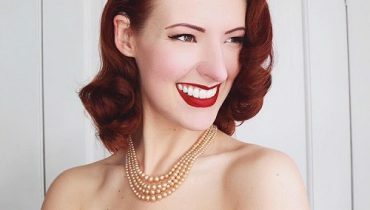 It also makes the changes in women’s fashions that followed in the late 40s and then the 50s even more understandable. 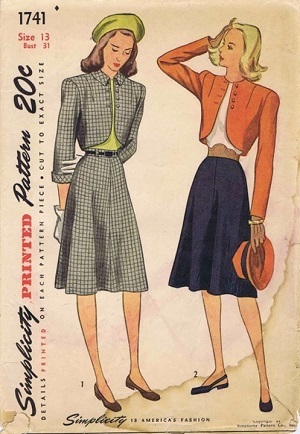 In part 2, we look at how women’s fashions transformed throughout the 1950s. 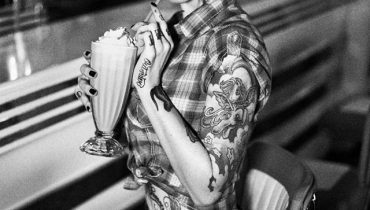 And surprisingly, despite the stereotypes, they weren’t just all swing skirts and halter tops!